Madagascar was originally settled by groups of both Austronesian and African origin. Those of more Austronesian origin settled in the central highlands while those of more African origin settled in the coastal regions. Over time, the Merina of the highlands expanded their dominance conquering most of the island by the early 19th century. The Merina maintained control of most of the island up until the French took control of the island in 1896. Throughout the colonial period, the French, of necessity, utilized the Merina in governing due to their socio-economic advantage over the coastal peoples. Out of this, grew a political rivalry between the Merina groups from the central highlands and the coastal groups which later formed into a loose coalition to contend against the Merina. After independence, it was this coastal coalition that succeeded in taking over from the French. In fact, nearly all of Madagascar’s heads of state were from coastal regions from 1960 until 2002 when Marc Ravalomanana succeeded Roland Ratsiraka. Do to their traditional political dominance the Merina were despised by most coastal groups, and Rastiraka’s ties to the Betsimisaraka group on the east coast set the scene for a tense rivalry during the 2002 elections. But is ethnicity the source of this rivalry? Or is it just a matter of who’s in power and who’s not? The nature and origin of ethnic groups in Madagascar make these answers somewhat ambiguous and illusive. The current political dynamics in Madagascar provide a unique and interesting context in which to do research. Whereas, traditionally, a coalition of coastal groups has been pitted against highlander groups, the current situation comprises two rivalries, both from the highlander group. In 2009, Andry Rajoelina started making accusations that the then current president, Marc Ravalomanana, was corrupt and abusing his power. Tensions increased, and with the military siding with Rajoelina, Marc was forced to step down. Since then Rajoelina has headed a transitional government and succeeded in passing a referendum on a new constitution. International negotiators have worked with all sides to draft a Road Map to end the transition and create a power sharing agreement. In March of this year, the Road Map was signed by the four major political parties and simultaneous presidential and legislative elections have been scheduled for September of this year. These events are monumental. 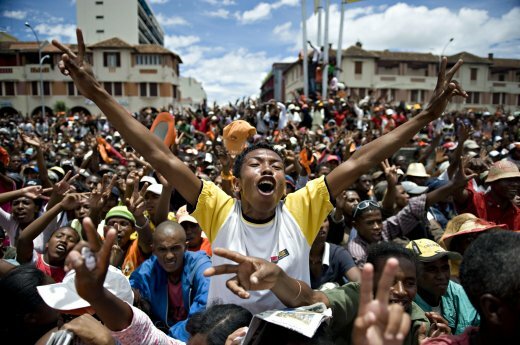 As Malagasy citizens look forward to elections this fall in the face of an intra-ethnic rivalry, it will be fascinating and incredibly insightful to ask questions about political participation and the effects of ethnic identity on those trends. What an interesting setting to research in. I was so glad to hear that you have been able to have a lot of success with your survey. What kinds of questions did you ask in your survey? Were the responses similar to what you thought they would be? I would love to hear how it all ends up when you analyze your findings.